Thanks for propagating the Israeli/US lies. Thanks for making a commitment on behalf of NZ to support Israeli apartheid. Thanks for denouncing a democratically elected government, you know, one voted in by the people of Gaza. But most of all, thanks for the expression of your absolute commitment to the rights of Israel to defend itself by targeting and killing civilians including many many women and children. Thanks for that Murray. What a c**t.
How about considering that it was Gaza who had a right to defend themselves from the Israeli attacks. How about acknowledging the war crimes committed by the Israeli government in targeting civilians and journalists with ‘surgical precision’ and using weapons banned under international law. Grrr. I was just reading the TVHE blog on student loans. The basic argument is that the government should reintroduce interest on student loans and that the government shouldn’t provide support for students while they study, because tertiary education is a choice. Money is created as debt. If you don’t believe me go search the RBNZ website and you will see reports that indicate that private banks create money out of loans. Loans are debts. The money created by private banks is not paper money or coins. Only the RBNZ is allowed to create that kind of money. Over 80% of money in NZ is created by private banks. Less than 20% is the ‘real’ money. When you take out a student loan, you create new money in society. The money didn’t exist until it was deposited into the bank accounts of those whom you were required to pay. And interest, well, that is the biggest deception ever. Interest is not money. It is an arbitrary figured applied to a loan amount that makes it difficult to pay the loan back. Not just because it increases the amount you owe, but because it represents an amount of money that does not actually exist. I’m not lying. The world is in a perpetual state of debt because money is created out of nothing by private banks or financial institutions and interest is a means to ensure that all the debt can never be repaid. You simply cannot pay back all the debt in the world because there is not enough money in circulation to do so. Printing more money will not solve this issue, because private banks will create more loans and therefore more interest to continually feed the cycle. So when someone says re-introduce interest to student loans to make borrowing cheaper for the government, I say screw you dude. Students are compelled to take on substantial debt just so that they can survive in the system created to enslave them,they shouldn’t be made to borrow more. To insist that students also be compelled to pay back interest on that debt, interest that is not even money borrowed and therefore not even money created, is to insist that students are easy exploitative targets and ought to therefore pay for the privilege of being screwed over by the money creating beasts known as banks.Oh, and that the government should be in on it. 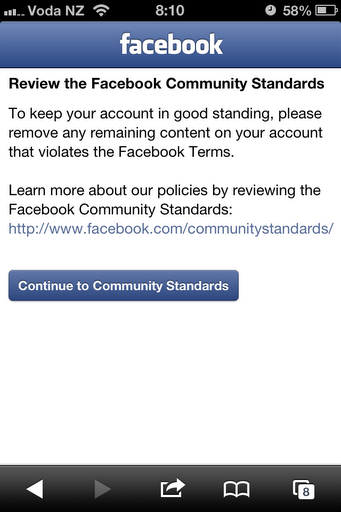 Facebook asked me to refer to its ‘Community Standards’ page to ensure my account stayed in good standing. And to remove further content that may be in breach. So curious as I was, I decided to read why my account might have been blocked and what content might cause it to be blocked again. I suspect the justification for the restriction was the graphic content of the image posted. However, I know for a fact that the particular story with the image attached was shared 4 times from the Gaza TV News page and once from my page, yet it was only my content that was removed. 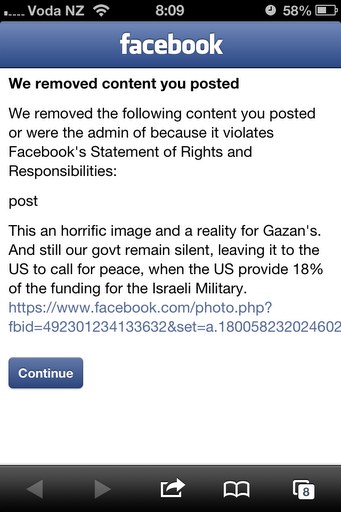 Of course, it would cause too much controversy if Facebook blocked a media company reporting out of Gaza. But me? a little old nobody in NZ, insignificant. My guess, is that it has nothing to do with the image although this was the excuse used to restrict access to my account. I have been particularly vocal on my account and have expressed my condemnation of the Israeli attack on Gaza. I have not attacked Israeli’s nor have I made any racist remarks. I am not anti-Jewish, anti-Israeli or anti-Semitic. I am against the tactics employed by the Israeli government and the propaganda used to justify the murder of innocent civilians in Gaza. I am against the Israeli occupation of Palestinian land and the oppression of the Palestinian people at the hands of the Israeli government. Admittedly, the image is extremely graphic, but if this was the reason for removing the content from my account then surely every account that posted the image should have had the content removed? Right? Wrong. 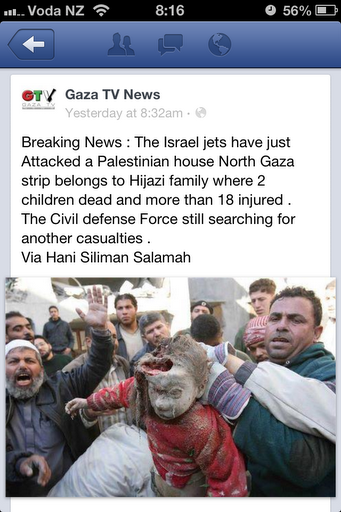 I can still access the story on Gaza TV News and other pages. It appears that while a media organisation may share graphic imagery, the privilege does not extend to individuals. If an image is considered not to balance the needs of a diverse community on one Facebook page, then it does not make much sense that it should be allowed to remain accessible on Facebook via other pages. Selective balance. Additionally, perhaps Facebook thought I derived some sadistic pleasure out of sharing the graphic content? F* off Facebook. I made it clear that I shared the image because down here in little old naive NZ our government is turning a blind eye to the atrocities suffered by the Palestinian people of Gaza. I included a message to that extent when sharing the objectionable content. So what’s really going on Facebook? I’m hearing from various sources that Facebook has restricted access to many Gazan’s or those expressing support for Gaza or Palestinian’s in general, I even note that Harry Fear (Documentary Maker, Activist, Journalist) was blocked from his Facebook account when he first started reporting live in Gaza. 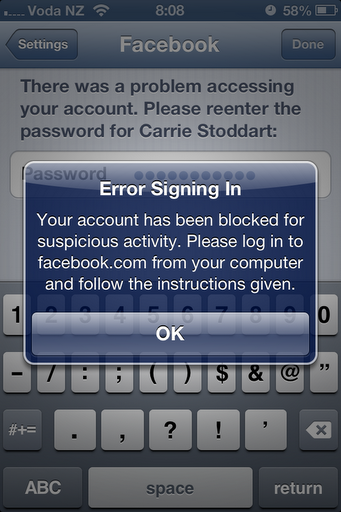 Facebook claiming it was administrative error. I was pure and simple censored for expressing views that were not complicit with the US position on Gaza. Facebook is as crony as any other massive corporation and will continue to suppress information sharing where it disagrees with what you have to say. I have never seen this photo. 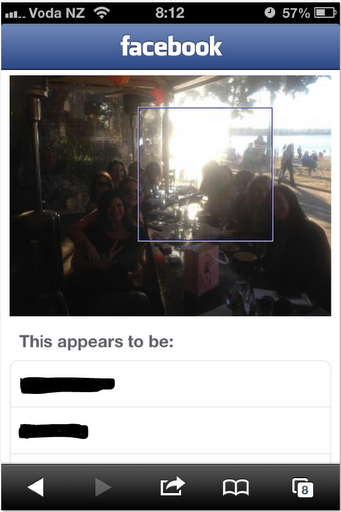 There were also photos of babies I’d never seen, and photos that friends had been tagged in by people that aren’t my friends, but your actual friend wasn’t even in the photo? Stupidity. The NZ Greens have posted a press release on Gaza. Disappointed. Kennedy Graham insinuated that the Palestinian Resistance were senselessly provoking the Israeli Military, thereby implying that they are responsible for the deaths of the many Palestinians. Echoing the bias western media. For the Party whom many New Zealander’s turn to for support for human rights, this is a massive fail. Your neutrality here is what Bishop Desmond Tutu refers to as support for the oppressor. Just hours before he was assassinated, the Hamas commander had received the draft of a long-term peace agreement with Israel, Baskin claimed. Having kept communication channels with Gaza open since the Gilad Shalit prisoner exchange, the activist was well informed about the state of the negotiations. The only political party to make a stand for Gaza so far is members of the Mana Party. I had the NZ Greens earmarked for my vote at the next election. This is a deal breaker. The Israeli military have reignited their attack on Gaza. This is not just an attack on a geographical area. It is an attack on people. It is a strategic war aimed at Israeli control and occupation of Gaza. Recently I posted on the issue regarding the AUSA’s President accepting travel to Israel. I also criticised the attack on the AUSA president by the SJP in response to her travel choice. I do not fully recant what I said, because the issue criticised was not the SJP cause, but their actions in censuring the AUSA President for travelling to Israel. My criticism was that the SJP had used the situation as a platform for their own agenda. Following from that post, I watched a film recommended and shown by the SJP at the University of Auckland Politics Week – Tears of Gaza. Suffice to say, I empathised with the strong emotion felt by those who spoke at the censure meeting and the passion behind their actions. I had felt that the SJP chose an inappropriate time to advocate their message. That was just my opinion. On reflection, had they not, then I, like many others, would be impervious to the Palestinian struggle given the way it is reported in mainstream media and the lack of objective views. I will point out that I do not support any form of violence. I don’t really want to discuss Hamas here because I have very little understanding of their organisation except that they are the military wing of Gaza and advocate for Sunni Islamism and have been denounced by the UN for human rights breaches against fellow Palestinians. I also understand that the West consider Hamas a terrorist organisation while, Arab nations, Russia and Turkey do not (http://en.wikipedia.org/wiki/Hamas). What I will say, is that I can see why such political groups are established even if I disagree with the tactics employed. And I will mention here that deaths of Israeli’s and Palestinian’s at the hand of Hamas are just as much victims as the Palestinian deaths caused by the Israeli Military. But there is also a difference in power balances. The Israeli Military are a high powered military force supported by their government with funding for continual improvement and expansion of the military. Palestine does not have an army. It does not have a navy. It has small factions that at the behest of Israel, the west coin terrorist organisations, as their only form of defence against these attacks. Additionally, the Israeli Military are indiscriminate in their ‘targets’. Those targets are people irrespective of age and gender. Irrespective of participation in the hostilities. Tears of Gaza shows images of babies or toddlers shot at point blank range in the head or in the chest. Buildings are bombed including schools full of children. Don’t forget the apparently ‘accidental bombing of the UN Schools in Palestine in 2009. The Palestinian people are subjected to some of the worst conditions for survival. They are imprisoned in their land. They are taxed for services that are not provided – waste, water, sewerage. They are starved through limited supplies. They are tortured by the persistent war on their people. And this is happening right now. People are dying. Children are dying. Grandfathers, Grandmothers, Mothers, Fathers, Brothers, Sisters, Aunts, Uncles, Cousins, often all from the same families are dying. They are not just dying. They are killed by the mercilessness of the Israeli Military. This is not a war. This is genocide. Do not rely on your mainstream media to depict the reality. Listen to the people. Understand their plight. There is no future for Palestinian’s if the West continue to ignore the atrocities perpetuated by the Israeli government. This is apartheid. Palestinians are systematically being exterminated for the benefit of Israel. What is New Zealand’s role in this? Nothing. We do nothing. Can we expect our Prime Minister to at least censure the Israeli government for the grave violations of human rights and the despicable acts of genocide in action? Probably not. Our current government is hell bent on establishing strong diplomatic ties with the US. The US who provide substantial support to the Israeli Government. I have tears for Gaza. We all should. Note: I will be moderating comments (if any) on this post. I will not tolerate hate speech and racism. So what is the real problem? It is money and the policy used to convince the public that the conditions within which we live are fixed and that there is no alternative. The value of money is determined by the market, and therefore so too is the value of an asset. A good or service is worth as much as you are willing to pay for it. The mistake is in thinking that money has an intrinsic value. It doesn’t. It’s a piece of paper with a number on it and what you can trade it for depends on what the market thinks it’s worth. I mean we can quantify money in terms such that $1 equals 100 cents and so on, but what it is worth is qualitative. As long as society believe that money has value based on a qualitative assessment of its worth, then the only logical outcome is to accept this neoliberal model that creates poverty to enrich and sustain those already privileged members of society. Corporate’s. The best example I’ve read about understanding the value of a bank note is that it is simply an IOU from the bank (In Ian Wishart’s ‘Daylight Robbery’). Fake credit. So the unemployed are pawns in a game designed to protect the value of capital that doesn’t exist? Society, this is messed up. The issue here is whether Tau Henare should have crossed the floor in support of Te Ururoa Flavell’s bill that would have allowed Members of Parliament to choose to swear allegiance to Te Tiriti o Waitangi. In my view, the answer is yes. Why? Because he delivered a very strong speech in favour of the bill. Although the bill was unlikely to obtain majority support from the house, in principle, Tau should have crossed. He should have done so because of his whakapapa and for his mana and the mana of the people. Such a move might have restored his reputation among the wider Maori community by signalling to them that he was willing to place the needs of not just Maori but any person who values Te Tiriti o Waitangi, ahead of the Party’s position. Recently, I had the privilege of listening to Tau Henare speak at the World Indigenous Lawyers Conference. I call it a privilege, because prior to his address I had him pinned as self-interested,arrogant and authoritarian. I was pleasantly surprised.While I disagreed with some of what he said, he was honest and he was passionate about Maori achievement. So I was shocked when he was challenged to cross the floor on the issues set out above and he gracefully declined on the basis that such actions lead to unstable government. Tau Henare is a seasoned politician, and it is unlikely that his position on the issue would be challenged by the National caucus. 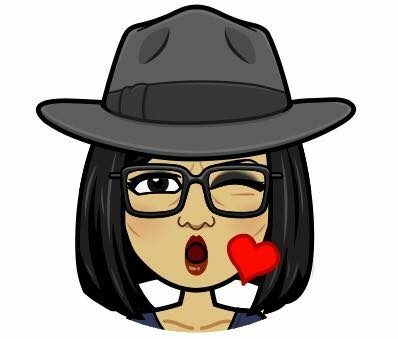 John Key made a statement today acknowledging that he knew of Tau’s opposition to the party position, and that Key does not prevent his MP’s from crossing the floor. While such a move might put the spotlight on the National Party in light of all the recent events including privacy breaches and bad taste comments, John Key and his political spin team would’ve surely been able to limit any negative publicity, and might have even been able to spin it in terms favourable to the National Party. Additionally, this would have shown that the issue is important not just to a few ‘radical Maori’ but to any person who values Te Tiriti o Waitangi as the founding document of Aotearoa New Zealand. Instead, he has done a disservice to the issue by backing down and voting against his own strongly held preferences. I question whether his desire to be Speaker of the House clouded his judgement on the issue. I hope not. Sugar. After demolishing my 6 inch sub and 2 ridiculously good cookies from Subway, I’m going to start this post by contradicting the meal I just ate. Today, the Green Party posted on their Facebook page that the Heart Foundation refused to withhold support for a children’s lunchbox snack on the basis that there is no evidence or studies to show that sugar causes heart disease. The snack comprised of 44% sugar, yet was endorsed with a Heart foundation tick. Admittedly, I can see the point of the Heart Foundation, if the foundation is premised on the view that it endorses any foods that are not proven to contribute to heart disease. But is that the role of the heart foundation? In my view, this is questionable. Presumably, food product companies have their products endorsed by the Heart Foundation because consumers purchase such products on the assumption that the heart foundation tick indicates the product is healthy. For the more informed consumer, they know this is bogus. But where did the assumption come from? Probably,the way in which food companies promote their products as having the healthy heart tick and unclear objectives of the Heart Foundation. So herein lies the issue. Should the heart foundation endorse all food products that are known to be good for your heart,that is, products that promote heart health and products that are known not to be harmful to either heart or general health; or should it endorse any foods in which there is no evidence that those products are bad for your heart even if there are proven health implications elsewhere. In my opinion, the Heart Foundation should endorse foods that promote a healthy heart and foods that do not contribute to other serious health implications that may indirectly cause heart problems. It is indisputable that sugar plays a role in both diabetes and obesity. These health conditions are on the increase in NZ and are both known to correlate to heart disease.I think it is irresponsible of the Heart Foundation to apply its market reputation to products (which is does so for a fee)that contribute to serious health issues, especially for children. In fact, I would go further to say, that food products ought to have health warnings on the packaging. Is this to punish those companies? No. Its to better inform the consumer about the choices they make in respect of the food they purchase for themselves and or their children. If tobacco companies are to be held accountable for the harm they cause consumers,then surely food companies ought to be held to the same standard. I’m not suggesting that food companies be subjected to ‘plain packaging laws’ only that they provide more information for consumers to make informed choices. No person may, without a coroner’s authority, make public any particular relating to the manner in which a death occurred if the death occurred in New Zealand after the commencement of this section; and there is reasonable cause to believe the death was self-inflicted; and no inquiry into the death has been completed. ***RIP Greg King “injustice anywhere is a threat to justice everywhere” (Martin Luther King).